Last week, in my post about overcoming injury problems, I was talking about how I had some Achilles tendonitis that arose from rushing into wearing them for my Obstacle Course Races (OCR) a bit too early, and how that came back to bite me on Tuesday morning. What’s interesting is that in researching it a bit, I found that although I was absolutely right that rushing into racing in my first pair of Vibram FiveFingers was what caused the problem, I was absolutely wrong about why it was the problem. A little background: I started my transition to barefoot shoes when I started to get serious about both OCR and natural exercise, such as MovNat, back in 2011. I had been doing workouts barefoot for quite a while, on the advice of Matt Furey (whose wonderful Combat Conditioning workout program I still recommend because it’s awesome). But those workouts were strictly bodyweight routines, doing lots of high-rep calisthenics of various kinds. They weren’t running. The biggest reason I started minimalist running, though, was because of all the problems I’d had with running in the past. For example: many of you know that I was primarily a competitive swimmer as a kid – from 7 years old through the end of high school. Swimming was a winter sport for us in Michigan, and during the first fall of my high school career I decided that I’d go out for the cross-country team to get my cardio up for the upcoming swim season. I ended up giving myself runner’s knee that season, and as I was a breaststroke specialist, knee issues were particularly bad (here’s an example of the breaststroke whip kick if you’re not familiar with it). My knees got so bad that I had trouble walking down stairs for a couple years after that. Needless to say, I didn’t run cross-country any more after that season. So while I wanted to run some OCRs, I was nervous about starting to run for exercise. When I started to read about minimalist running and how it alleviated knee and other issues for runners, I figured it was worth a try (and before you get on me and tell me that I learned my lesson for thinking that way, it definitely worked for the knee issues). My first OCR – Warrior Dash 2011. I was hooked. I started to train in my FiveFingers (I was wearing the KSO model) regularly for running the spring of 2011 with short runs, building up slowly until I (thought I) was ready to try them in a race. 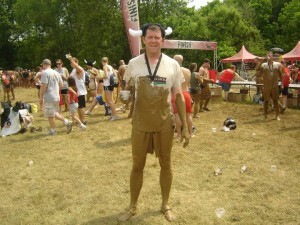 And that first race was the 2011 Ohio Warrior Dash, down in Logan. It was a VERY hilly approximately 5K course, in the Hocking Hills region of Ohio. Seriously, at the time most of the folks I talked to said it was the hardest Warrior Dash that they’d done (and a fair amount of the people had done quite a few). And I handled it pretty well. Yeah, my calves were a bit sore, but nothing to write home about. I chalked it up to still getting used to the FiveFingers and frankly, I was right. They stress and stretch the calves a lot more than typical positive-heel shoes (shoes where the heel is higher than the ball of the foot – AKA most shoes). The next race I ran was a month later, the 2011 Ruckus Run in Columbus. This race was literally right around the corner from my house between then-Crew Stadium (now MAPFRE Stadium) and the Ohio State Fairgrounds. They ran it in the parking lot area (which was a dirt lot, mostly, but did have some paved sections) and through some of the terrain around the fairgrounds – dirt hills, culverts, etc. It was, compared to Warrior Dash, flat as a pancake. But the obstacles in it were really good – including a few that you had to sit back and try to figure out how to take on (like traversing a series of hanging ropes with loops at the bottom, an OCR standard now but quite the mind-bender back then). The other big difference was the distance: 4 miles instead of approximately 3.1 miles. Here’s the thing: because of the congestion on the course at Warrior Dash (lots of people on narrow, hilly trails), there was lots of walking up and down the hills as there were bottlenecks in front of some of the obstacles. Ruckus wasn’t nearly as congested (which was one of the pluses of it to a point) so I was able to run most of the way. And I got more tired – I ran further and more in that race than I did at Warrior Dash. And after the race, my Achilles tendons were so sore that I needed crutches the next day to get around. I chalked the problem up to the wrong thing. As I got tired, and my proper “barefoot” running form started to break down, I figured I was heel striking, and that was what was causing the problem in my Achilles tendon. Made sense to me – the primary thing you always hear about running barefoot is that you have to land mid-foot, and as the course had more paved portions on it, heel striking would have been really painful. Landing right on the back of the foot with those shoes on would have hit just below the connection to the Achilles tendon. Turns out that I was very wrong. After my recent issues with Achilles tendonitis popped up after my run on Tuesday, I was looking at some of the sports medicine websites for the best way to recover quickly from this issue (hint: there’s no way to do it quickly – you’re just going to have to rest and do active stretching regularly, basically). And perhaps because of there being more information out there now on the proper way to run “barefoot” due to more people trying it, I found new information that I didn’t know before. Here’s the deal: your Achilles tendon is attached to your calf muscles and the bottom of your heel. Having tight calves puts extra stress on your Achilles tendon, and exacerbating that without proper maintenance and a good warmup including some active calf stretches is what causes the tendonitis to start and for the pain to kick in. So it wasn’t impact that was causing my issues, it was the calf stress and the overstretching. But, ironically, perhaps, the fatigue I was feeling and the breakdown of my running form was what caused the problems in both cases. Here’s a great infographic about proper running style. A skilled barefoot runner, as we see in the left-most runner, stands nearly upright. The picture doesn’t show this, but the runner’s stride is much shorter, too. The foot should land directly under your body, and you should be pushing back with your hamstrings instead of reaching forward with the quadriceps. And the pace should be a lot faster – the turnover between strides should be much quicker than it is for the unskilled jogger show on the left side. So here was my problem back in 2011: as I got tired at that Ruckus race, in an environment where my pace was much more natural and flat (unlike that Warrior Dash where it was up and down and foot landings were very different), I was reaching forward and looking like the center runner in that picture – feet not landing directly underneath me naturally but in front of me. That was what was putting the extra strain on my calves, and therefore my Achilles tendons. I’ve always had a really long stride, one that was supported by my standard-running-shoe-wearing habit that allowed a heel strike. I apparently have more issues with that when I get tired. And that’s also what caused my knee issues way back in 1984. Now, here’s what I think happened on Tuesday: my previous workouts had been either sprints, which is an entirely different running form, or shorter runs broken up with stops to do various calisthenics and such. I didn’t have time for my form to break down. But going for one long, sustained run on Tuesday morning brought back some of those pains. So lesson learned. Not only do I need to use the off season to get into better running shape, period, I also need to use the time to improve my technique, across the board. And I need to pay careful attention to my form the whole time. Luckily there are plenty of ways to do this: VivoBarefoot has an app for checking your running style via video and an iPhone, and also there are practices like Chi Running with iPhone apps and the like that help to develop the skills we need to run properly. It’s always a good thing to have a plan when you work out – haphazard workouts lead to haphazard results. And it’s also a good thing to be able to look at your past issues with a new light. Correcting our outlook as to what’s causing our problems to something more correct enables us to get them really fixed. What problems have you had to refocus on? How has new information changed your plans? Share in the comments, and please share this post on social media as well! ← Injury Strikes: How Do You Respond?